Evelyn Patricia Terry: America’s Favor/Guests Who Came to Dinner (and Stayed!) opens at the Lynden Sculpture Garden on Sunday, April 28, 2019 with a reception from 3 to 5 pm. The reception is free and open to the public. 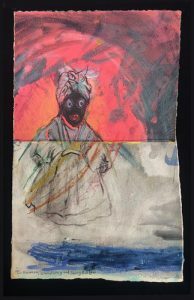 “America”—from its origins to present day news reports of racial and ethnic interactions–is a recurrent theme in Terry’s work. Over the course of more than fifty years, she has made several bodies of work that address the “conundrum of co-existence that repeatedly occupies the news, my thoughts, and many conversations.” In America’s Favor/Guests Who Came to Dinner (and Stayed! ), the most recent in a series of exhibitions on the theme, Terry brings together different bodies of work: an iconic table installation, artist books, and mixed media works that layer drawings and other forms of mark-making on sewn rag paper pieces. In the rear of the building, Terry will be exhibiting nine works from her Play the Race Card series. The series dates from 2006-7, when Terry began using torn canvas strips recycled from previously set-aside paintings. Focusing on two politically and emotionally charged color groupings, “red, black and green” and “red, white and blue,” on a backdrop of other colors, this work promotes race conversations as commonplace topics like weather–absent the political biases, empowerment drain, and emotional damage harbored. The exhibition remains on view through Sunday, July 28, 2019. The Lynden Sculpture Garden is located at 2145 West Brown Deer Road, Milwaukee, WI 53217. During the course of the exhibition, Terry will be offering a series of hands-on workshops at Lynden. America’s Favor/Guests Who Came to Dinner (and Stayed! ), is part of Lynden’s 2019 Call & Response programming. Call & Response is an ongoing project that gathers a community of artists who share a commitment to the radical Black imagination as a means to re-examine the past and imagine a better future. Other participants in the 2019 programming include indigo activist Arianne King Comer, visual artist and Nohl Fellow Rosemary Ollison, filmmaker and storyteller Portia Cobb, chef and food scholar Scott Barton, choreographer Reggie Wilson, and performance collective Propelled Animals, among others. Evelyn Patricia Terry has returned to “America” several times over the years, and its episodic manifestations can be read as a kind of diary. In 1996, working with the Haggerty Museum of Art, Terry created her first table installation, Guess/Guests Who Came to Dinner, at the (former) Watts Tea Shop. This original dinner table featured mismatched plates, assorted stemware, various ethnic dolls, and a Reverend Josephus Farmer Statue of Liberty sculpture from her art collection. For Guests Who Came to Dinner (and Stayed), made for Pure Black, an exhibition Terry co-curated with Della Wells at the University of Wisconsin-Milwaukee Union Art Gallery in 2004, she expanded the installation, placing written words and healthy raw foods–ginger, garlic, lemons–on each plate. She took up the theme again in two series of artist books America’s Favor (named from her 1972 screen print edition) and America: Guests Who Came to Dinner (and Stayed)—named after the table installation. Most recently, Terry was invited to display the table installation at the Mobile Design Box, a local alternative space, and to fill the empty walls with two-dimensional work that could be hung with pins or tacks. Working on short notice and with these restrictions, Terry elected to use the space as a studio to produce a new body of work. Searching out all the marked-up rag paper pieces she had fortuitously filed and saved over the years, she created vertical and horizontal substrates by randomly sewing several pieces together. She enhanced these sewn compositions with new marks and figurative drawings of her female and male ethnic doll collection in their “country of origin” dress, building thematic connections to the table installation. The figures are drawn alone or coupled, sometimes in strange inter-ethnic relationships and sometimes together with “their own kind.” Text, too, has been an essential and continuous element in the “America” series, appearing on plates, across book pages, on cards, and in titles that provide clues to the artist’s thoughts. For this exhibition, Terry will be producing new books and mixed media works. America’s Favor/Guests Who Came to Dinner (and Stayed! )is the latest entry in Terry’s diary. She has mined her five-decade history as an artist to create the exhibition by repurposing the torn and cut sections of etchings, screen-prints, monotypes, and randomly printed rag paper scraps that she has accumulated as a printmaker, and by referencing items in her personal collection, from ethnic dolls to the work of other artists. America’s Favor/Guests Who Came to Dinner (and Stayed!) is the latest entry in Terry’s diary, an up-to-the moment index of the artist’s aesthetic and material interests, her personal concerns, and her approach to embracing the world she lives in. Evelyn Patricia Terry is a full time professional visual artist, presenter, writer and art collector based in Milwaukee. She works across many media: printmaking, drawing, painting, installation, and public art. During her long career, she has garnered awards, fellowships, grants, and commendations for community work with students and other artists. Concentrating on printmaking, she earned both a BFA and an MS in Visual Arts from the University of Wisconsin-Milwaukee (UWM). She earned an MFA from the School of the Art Institute of Chicago after Ruth Milofsky, a UWM arts education professor and mentor, set up a fund to give her a deadline to go back to school so she might be better prepared as an artist. In 2012, Terry received the Wisconsin Visual Artist Lifetime Achievement Award from a Wisconsin consortium of art and humanity organizations. In 2014 the Milwaukee Arts Board honored her with their Artist of the Year Award. Terry’s work is internationally exhibited and collected; over 400 private, corporate, and public collections own her artwork including the Milwaukee Art Museum, the Museum of Wisconsin Art, the Haggerty Museum of Art at Marquette University, the Racine Art Museum and the Wright Museum of Art at Beloit College. From 2016 through 2018, several universities—including UWM, the University of Wisconsin-Madison, and Duke University–acquired Terry’s hand-constructed artists’ books. In 2009, influenced by Dr. Margaret Burroughs, a visual artist, poet, and founder of the DuSable Museum of African American History, and by Chicago art consultant Susan Woodson, Terry founded the Terry McCormick Contemporary Fine and Folk Art Gallery, a home-based gallery, following the death of her partner, self-taught folk artist George Ray McCormick, Sr. The Lynden Sculpture Garden offers a unique experience of art in nature through its collection of more than 50 monumental sculptures sited across 40 acres of park, lake and woodland. The sculpture garden is open to art and nature lovers of all ages daily, 10 am-5 pm; until 7:30 pm on Wednesday evenings in the summer; closed Thursdays. Admission to the sculpture garden is $9 for adults and $7 for students and seniors; children under 6 and members are free. Annual memberships are also available. The Lynden Sculpture Garden, 2145 W. Brown Deer Road, Milwaukee, WI 53217, welcomes winter on January 26, 2019 with a day of outdoor art-making, studio activities, nature walks, scavenger hunts, performances, and whatever other winter activities–ice skating, cross-country skiing, snowshoeing–the weather permits. The event, which runs from 10 am-4 pm, is free to members or with admission to the sculpture garden ($9 general/$7 students & seniors; children under 6 free). Family passes are $20 and are available in advance (call 414.446.8794) or at the door. Lynden’s 9th Annual Winter Carnival is sponsored by Davey Tree Expert. This year the highly participatory, artist-driven carnival, curated by recent MIAD graduate Joe Acri, features a large sculpture/performance piece created by Winter Carnival artist-in-residence Jordan Rosenow. Two current Lynden artists-in-residence will be launching their residency projects during the carnival. Jenna Knapp will introduce the Labyrinth Society of Lynden Sculpture Garden, unveiling plans, soliciting members, holding two Society meetings, and—weather permitting—building an ephemeral labyrinth in the snow. Kim Khaira, joined by Rohingya refugee leader Hasinah Begum, begins Pulang Balik (“I Am Going Home Too”) with a day-long mehndi (henna painting) session. Open Kitchen, a Milwaukee-based experimental food studio and residency, will serve Bolillos de Mole (cacao-mole bun) and Wisconsin Wild Rice Horchata, with notes on fictional motives, motifs, and motion, by Maria Quintero and ADO. There will also be button-making, printmaking, a tree walk, naturalist outings, and candle dipping. Winter Carnival artist-in-residence Jordan Rosenow presents Stages, a large-scale sculpture and site-specific performance series.The installation is a 70 x 70-foot fabric grid that functions as both an anchored sculpture and a colorful stage for each dancer. Rosenow has been making a dance with the students in Kim Miller’s Collaboration & New Genre class at MIAD. These performances will be repeated at 12 pm, 1:30 pm, and 3 pm. Jordan Rosenow is a visual and performance artist focusing on the relationships of material and bodies through a queer, feminist lens. She is currently based in Brooklyn, NY after spending formative years working in Minneapolis, MN. Rosenow has exhibited at The White Page, Rochester Art Center, ACRE Projects, The Soap Factory, and Franconia Sculpture Park. Her performance work has most recently been presented at The Walker Art Center and Fresh Oysters Performance Research. She is the editor-in-chief of INREVIEW, a free, printed quarterly publication dedicated to presenting critical responses and engaging extended conversations about art in the Twin Cities. Artist Jenna Knapp launches her residency project, Labyrinth Society of Lynden Sculpture Garden, with images, sketches, and plans. 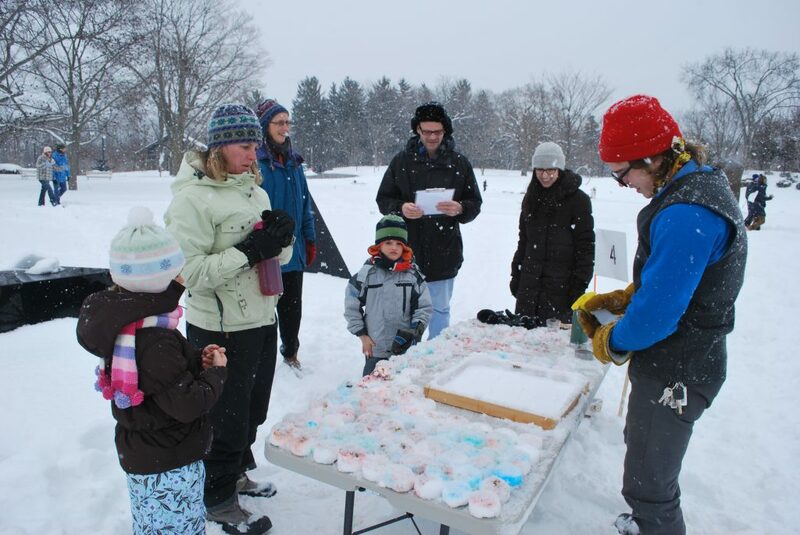 Become a founding member of the LSLSG, sign up for a work day, attend a Society meeting, and–weather permitting–build an ephemeral labyrinth in the snow. Knapp will be in residence all day; Society meetings are at 11 am and 2 pm. The planning and practice of mehndi builds sisterhood/community and encourages self-expression. Kim Khaira begins her Lynden residency, Pulang Balik (“I Am Going Home Too”) by joining Rohingya refugee leader Hasinah Begum to showcase the art and appreciation of henna in the South/Southeast Asian community and beyond. Stop by their booth from 10 am-4 pm to learn more about henna and to have your hand decorated. On the first of two visits to Lynden, Open Kitchen, an experimental food studio and residency, will serve Bolillos de Mole (cacao-mole bun) and Wisconsin Wild Rice Horchata, with notes on fictional motives, motifs, and motion, by Maria Quintero and ADO. The kitchen will be open from 11 am to 3 pm. Open Kitchen (Rudy Medina and Alyx Christensen) is located in Riverwest. Maria Quintero is a self-taught artist located in Chicago’s Pilsen neighborhood. When not working as a hairdresser, Maria sketches out of idleness and boredom. ADO is a collective author that focuses on semi-fictional research for the understanding of socio-cultural abstractions. ADO is the founder of ASAP (Association-Appropriation-Abbreviation), an alchemistic application for critically engaging issues of alienhood and livelihoods. From 10-11:30 am, naturalist Naomi Cobb will have examples of Lynden’s wildlife will on display and she is issuing a challenge to find evidence of their existence on our grounds. Super nature detectives win prizes. Snowflake catchers and hand lenses also available. At 1:30 pm and 2:30 pm she will lead a guided walk through the back acres of Lynden to investigate the habitats that are home to our non-human neighbors. Join Jeremy Stepien in the upstairs art studio for drop-in art activities (and to warm up). From 10 am-12:30 pm, he’ll be running a printmaking project, Tracks in the Snow. Then, from 1-4 pm, you can make your own dip candles. Emma Smith runs a winter-themed button-making station throughout the day. At 11:30 am, current land manager Kyle Welna and former land manager Bob Retko lead a walk around the grounds showcasing the variety of trees at Lynden. The Lynden Sculpture Garden is located at 2145 West Brown Deer Road. Admission is $9 general, $7 for students and seniors. Members and children under 6 are free. Admission includes access to the sculpture garden and house. All events listed below are free with admission unless otherwise indicated. Memberships are available. In November, the Lynden Sculpture Garden is open from 10 am to 5 pm every day except Thursdays (closed). A delightful novel about surprising friendships, community, and the way small acts of kindness can change a life, from the bestselling author of The Story of Arthur Truluv. Lucille Howard is getting on in years, but she stays busy. Thanks to the inspiration of her dearly departed friend Arthur Truluv, she has begun to teach baking classes, sharing the secrets to her delicious classic Southern yellow cake, the perfect pinwheel cookies, and other sweet essentials. Her classes have become so popular that she’s hired Iris, a new resident of Mason, Missouri, as an assistant. Iris doesn’t know how to bake but she needs to keep her mind off a big decision she sorely regrets. When a new family moves in next door and tragedy strikes, Lucille begins to look out for Lincoln, their son. Lincoln’s parents aren’t the only ones in town facing hard choices and uncertain futures. In these difficult times, the residents of Mason come together and find the true power of community—just when they need it the most. This event is co-presented by Milwaukee Reads and Boswell Book Company. We wrap up six months of 2018 Call & Responseprogramming with an informal conversation in conjunction with Tyanna Buie’s exhibition, Im•Positioned. Buie grew up in and out of the foster care system in Milwaukee and Chicago, and photographs and other material evidence of her disrupted childhood are rare. She continues to rely on the collective memory of her family to make connections between her past and present. Im•Positioned also raises the larger question of the histories of Black families by responding to Eliza’s Peculiar Cabinet of Curiosities, Folayemi Wilson’s 2016 installation on the grounds at Lynden. A full-scale structure that is both wunderkammer and slave cabin, Eliza’s Cabinet imagines what a 19th-century woman of African descent might have collected, catalogued and stowed in her living quarters. In 2017, Portia Cobb began her own response to Eliza by planting Lizzie’s Garden in proximity to the cabinet. The Gullah Geechee garden, an homage, in part, to Cobb’s great aunt Lizzie, is at the center of her project: Rooted: The Storied Land, Memory, and Belonging. The three artists will discuss their own work and their place in the “call and response” model that gathers a community of artists at Lynden who share a commitment to the radical Black imagination as a means to re-examine the past and imagine a better future. For the fifth year in a row, Lynden is a registered site for the Cornell Lab of Ornithology’s Project FeederWatch. The main goal of this citizen science project is to combine the interests of backyard bird watchers with the needs of ornithologists who study bird populations. By making simple, standardized counts of the birds in their yards (or, in this case, at Lynden) and reporting them to the FeederWatch database, FeederWatchers contribute directly to the scientific understanding of bird populations. These observations help scientists study changes in the distribution and abundance of feeder birds over time. We have established bird feeders on the grounds, using the recommended seeds to attract birds through the seasons. We have binoculars and color charts to help us identify the birds at our feeder. Now, we need bird viewers of all ages and experience levels to join us on our siting days to help tally our observations for the project. Free to dogs and members or with admission to the sculpture garden. Bring your canine friends for our annual post-Thanksgiving dog day, the perfect occasion for a postprandial stroll. Dogs must be leashed and considerate of other visitors, canine and human. Lynden is offering a series of holiday giftmaking workshops in November and December. They range from simple activities suitable for families with smaller children to more advanced workshops for adults. Whether you are making a gift for yourself or another, these workshops should provide a cheerful atmosphere for art making as we head into winter. Marbling is the ancient art of “floating” paints on a water bath, then combing and raking them into intricate patterns. In this workshop, you will learn how to apply acrylic paints to a water bath and create beautiful one-of-a-kind papers. You will go home with 12 or more of your own papers for use in your next project, from bookbinding to card making to paper crafting. Fee: $85/$75 members (all materials included). The practice of making temari originated in China and made its way to Japan, where it is said that Japanese noblewomen, confined within castle walls during times of war in the feudal period, made the decorative balls for their children. Temari are now made by mothers and grandmothers for a new child on New Year’s Day. Spend the day learning to make one of these beautiful thread jewels as a gift or decoration. Begin by making the inner ball—with a surprise inside—from scraps of fabric and yarn. Then cover the 2 ½-3-inch ball with the kiku herringbone stitch using a simple ten-division/five-petal design. All materials provided, no experience necessary. Fee: $70/$60 members (all materials included). Wet felting is an ancient and magical hands-on fiber art process. In this workshop we will use our imaginations and colorful wool fibers and yarns to lay out unique designs for our table runners. Next, prepare for an arm workout and some splashing as we use soap and water to roll and transform our fibers into felt cloth. No experience required. Teachers-in-residence Sue Pezanoski Browne (La Escuela Fratney) and Katie Hobday (Bruce-Guadalupe Community School) team up to offer quarterly hands-on workshops for educators on the theme of this year’s Innovative Educators Institute: entanglement. These relaxed, informal workshops are designed to encourage open-ended experimentation with materials, processes, and concepts (new materialism, principles of possibility, artful thinking routines) within the context of arts-integrated, place-based education. Suitable for all K-12 teachers. What is the new materialism in practice? In this workshop we will stitch together fibers and stories, personal objects and narrative (look for strong connections with language arts) as we make meaning through objects, processes, and experiences. Like contemporary artists using fibers in their painting and sculpture practices, we will explore a range of approaches to textiles: stuffing and sewing, embroidering, stamping, distressing, and more. Handouts to include an illustrated glossary of embroidery stitches. Join artist, author, and activist Jenna Knapp for this series of drop-in workshops focusing on self-care techniques. Working with a variety of materials, bind your very own gratitude journal to celebrate the season of thanks. Learn how to do a simple stitch and experiment with bullet journaling to record and remember your daily gratefuls. Drop into our studio for informal art exploration. Come for 30 minutes or stay for 2 1/2 hours; visit weekly or stop by when you need an after-school activity; bring a friend or sibling or try it on your own. Each week we’ll introduce different materials, processes and themes, and get you started on a project. We’ll focus on three-dimensional artmaking–though we will also do plenty of painting, drawing and collaging–and make use of Lynden’s special resources: the collection of monumental sculpture and 40 acres of park, lake and woodland. Fee: $10/$8 members (includes admission to the sculpture garden for one adult and one child aged 4 or under; additional children $4 each; extra adults pay daily admission). The 40 acres that house the Lynden collection of monumental outdoor sculpture are also home to many birds, insects, frogs, mammals and plants. Naturalist Naomi Cobb offers a nature program that explores a different theme each month, taking into account the changing seasons, and provides an opportunity for those with very small children to engage in outdoor play and manipulation of art materials. The theme for November is cozy places. How do we understand the spaces we inhabit every day: our homes, communities, natural environments? What histories, memories, and identities shaped these places and how we understand them today? We’ll look for answers to these questions in the work of artists John Grade, Juliana Santacruz Herrera, and Jan Vormann as we uncover, re-narrate, or restore place. In the studio we’ll create colorful felt sheets that we’ll take outside, along with yarn and string, to repair the worn or weathered spaces we find as we meander through the grounds. Ages 6-15. Stamping is a form of printmaking, and we invite you to drop into the studio for this all-ages introduction to rubber stamp-making. We will create our own personalized rubber stamps from start to finish, and then try out some stamping on paper. You can take your stamp home to use on handwritten letters and envelopes, or to include in your own stationery design. With many schools closed for the holiday, we’re offering an extended Art Drop-In session prior to Thanksgiving. Drop into our studio for informal art exploration. Come for 30 minutes or stay for 5 hours; bring a friend or sibling or try it on your own. We’ll introduce different materials, processes and themes, and get you started on a project. Supporting artists is a significant part of Lynden’s mission. One of the ways that we support artists is by administering the Greater Milwaukee Foundation’s Mary L. Nohl Fund Fellowships for Individual Artists program. The three jurors who will be selecting the five recipients of the Greater Milwaukee Foundation’s Mary L. Nohl Fund for Individual Artists Fellowships (2018) will give a public talk about their institutions and curatorial interests. Come meet Lucy Mensah, visiting assistant professor of Museum and Exhibition Studies at the University of Illinois Chicago; independent curator Risa Puleo; and writer, editor, and curator Ashley Stull Meyers. The talk begins at 6:30 pm and is preceded by an informal reception. More giftmaking opportunities in December: Leslie Perrinooffers one of her popular silk scarf painting workshops (Dec. 2), David Cobb and David Weissman of the Milwaukee Crafts Guild show you how to make your own wooden cutting board (Dec. 8), and in our monthly family workshop we’ll be making gifts for the birds (Dec. 9). Jenna Knapp and the Self-Care Studio drop in on for another aromatherapy session—this one on making herbal tub teas (Dec. 9). Tuesdays in the Gardenconsiders winter trees (Dec. 11), art drop-in runs until the middle of the month and then goes on hiatus, and dog dayis on the 15th. And who knows, maybe there will be ice skating. The Lynden Sculpture Garden offers a unique experience of art in nature through its collection of more than 50 monumental sculptures sited across 40 acres of park, lake and woodland. The sculpture garden is open to art and nature lovers of all ages from 10 am to 5 pm every day except Thursdays (closed). Memberships are available. More information: http://lyndensculpturegarden.org or 414.446.8794. In August, the Lynden Sculpture Garden is open from 10 am to 5 pm every day except Thursdays (closed); the sculpture garden remains open until 7:30 pm on Wednesday evenings. Ibile is a Yoruba word for “the messenger of our ancestors.” Arianne King Comer makes textile works—paintings–using centuries-old resist-dye processes. These works come from her spirit and represent her ancestors’ call. Many of the landscapes included in this exhibition of paintings, quilts, and dyed textiles depict the past—slave cabins, indigo preparation–and present of the South Carolina Low Country that Comer calls home. Among the works, most dating from the past two years, are two intimate scenes of Lynden made during Comer’s residency last summer. When Comer arrives for her 2018 residency in early July, her solo exhibition, Ibile’s Voice, will slowly become Ibile’s Voices as her paintings are joined by the works of the community members who gather with her around the dye vat. For Im•Positioned, an exhibition in the gallery at Lynden, Tyanna Buie responds to the work of Folayemi Wilson, Reggie Wilson, and other artists in residence at Lynden for Call & Response. Buie was a 2012 Nohl Fellow, and this exhibition has been organized in conjunction with the 15th anniversary of the Nohl Fellowship, a program administered by the Bradley Family Foundation. The exhibition is open Wednesdays, Saturdays & Sundays during Lynden’s regular hours, or by appointment. Located beside Big Lake, the Bonsai Exhibit at Lynden—a collaboration with the Milwaukee Bonsai Society and the Milwaukee Bonsai Foundation–includes a display area for bonsai, waterside teaching patio, and pollinator garden. In the warmer months, Lynden stays up until 7:30 pm on Wednesday evenings, a perfect time to visit the garden for a picnic or stroll. Fee: $12/ Adults; $8/students, children 6-17, seniors, active military with ID. Advanced registration is required. As you walk with our knowledgeable docents, you will learn more about the history of Lynden and our collection of 50 monumental sculptures sited across 40 acres of park, lake and woodland. Margy Stratton, founder and executive producer of MILWAUKEE READS produces this series of events featuring writers of particular interest to women. She joins Boswell Books in welcoming New York Times bestselling author Jenna Blum back to the Lynden Sculpture Garden. Spanning three cinematic decades, from the explosive 1960s and swinging 1970s to the glittering 1980s, The Lost Family artfully brings to the page a husband and Holocaust-survivor devastated by a grief he cannot name, a frustrated wife struggling to compete with a ghost she cannot banish, and a daughter sensitive to the pain of both her own family and another lost before she was born. Free to members and with admission to the sculpture garden. Artist-in-residence Portia Cobb continues her exploration of her South Carolina roots as she responds to and extends the narrative first created by Fo Wilson, in Eliza’s Peculiar Cabinet of Curiosities, when she imagined a 19th-century enslaved woman and what she might collect in her living quarters. Cobb has conjured “Lizzie,” a Gullah-Geechee woman, descended from Africans captured along the coast of West Africa. By Cobb’s reckoning, Lizzie was born in coastal South Carolina 20 years after the American Civil War and 10 years following Reconstruction. Lizzie is a woman born free, descended from survivors of slavery, who is independent and living within a newly emancipated community. “Lizzie” also honors the memory of Cobb’s great aunt Elizabeth Ashe-Smashum (1887-1976). As the only girl in a family dominated by brothers, Aunt Lizzie became the caregiver of nieces and nephews, creating stories and involving the children in directed performances and recitations of selected works by African-American writer Paul Laurence Dunbar. Following the death of her husband, Aunt Lizzie introduced “Uncle Pomp,” a ghost-hobo character who emerged, mounted on a horse, when Aunt Lizzie needed to entertain or exact obedience. Cobb takes this opportunity to re-imagine Lizzie, her aunt, and Uncle Pomp. She will be joined by the Jazzy Jewels of Milwaukee and the Silverado Trail Riders. This is a Call & Response event. Bring your canine friends for a stroll. Dogs must be leashed and considerate of other visitors, canine and human. A limited number of VIP Tables for 8 are available. Reserve by phone at 414-446-8794. Join us for our seventh annual fundraiser to benefit Lynden’s education programs, featuring a feast of local, sustainable foods catered by Braise (including a kids’ menu and ice cream station), entertainment including close-up magic by Matthew Teague, music by Sista Strings and members of the Nathan Hale High School Orchestra, hands-on art and nature activities, a silent auction, and more. All proceeds benefit our education programs, which serve more than 4,500 children each year. Free to members or with admission to the sculpture garden. Advance registration encouraged. Poet/birder and artist-in-residence Chuck Stebelton continues his series of bird walks at Lynden this fall, and he’s bringing friends! Please wear appropriate footwear and bring your binoculars if you have them; no previous birding experience required. Learn to create a book the old-fashioned way, by folding paper into signatures, sewing those signatures on a sewing frame, and making a case. You’ll even get to try your hand at gold tooling. You will go home with your own handmade blank book, bound in cloth and marbled paper. All materials, including paper, book cloth, hand-marbled paper, sewing supplies and adhesive, are included. Tools are provided. Participants will receive a course book with pictures and a step-by-step description. It can be challenging to do something useful and sustainable with your food scraps when you live in an apartment in the city. Farming communities throughout Latin America and parts of Asia have been using bokashi, a method that turns waste into a fertilizer that uses less time and space than traditional composting methods. Bokashi is a soil amendment produced by using particular microbes to ferment wastes such as food scraps. Though slow to catch on in the United States, some urban dwellers have turned to making bokashi with their food scraps rather than throwing them away or adding them to a compost pile. This workshop will show you how to transform food scraps into a “probiotic” for your garden using primarily your own food waste and a five-gallon bucket. Attendees will go home with a bucket retrofitted to make bokashi as well as inoculated material that can be used to make your first batch of bokashi. Creative people tend to gather things that have special meanings attached to them. These small items may collect dust in a bin hidden at the back of the closet until re-discovered and put to use. In this workshop, sculptor Jeff Boshart invites you to bring a gallon-sized bucket of these keepsakes to reconfigure into a sculpture or dimensional wall work. Utilizing elements of design and principles of organization, we will “tinker” with the parts: exploring color, texture, and form as we figure out how to assemble the parts into something bigger and better than the individual fragments. Mother Nature gave us the lever, center of, and moment (think rotation around a point). Artisans and sculptors use these physical concepts to generate ideas and inform aesthetic choices. Using found and repurposed materials, sculptor Jeff Boshart puts these concepts to work as we construct simple balancing toys. The 40 acres that house the Lynden collection of monumental outdoor sculpture are also home to many birds, insects, frogs, mammals and plants. Naturalist Naomi Cobb offers a nature program that explores a different theme each month, taking into account the changing seasons, and provides an opportunity for those with very small children to engage in outdoor play and manipulation of art materials. The theme for August is splashing color. Lynden’s art and nature camps for children aged 20 months to 15 years integrate our collection of monumental outdoor sculpture with the natural ecology of our hidden landscapes and unique habitats. Led by artists, naturalists, and art educators, the camps explore the intersection of art and nature through collaborative inquiry and hands-on artmaking, using all of Lynden’s 40 acres to create a joyful, all-senses-engaged outdoor experience. Camps conclude with an informal showing for family and friends. Join us for a summer of art and nature! We are working on the fall schedule, but here are a few dates to save: Tuesdays in the Garden explores prairie life on September 11; Urban Forest Fest (a family free day) returns on September 15; September 22 is a dog day; on September 23 we throw open the doors for Doors Open MKE; and Chuck Stebelton returns for another fall bird walk on September 30. Several fall activities start up again in September: our weekly art drop-in starts up on September 12 for those aged 11 and up, and on the 13th for younger children (ages 6-11). The Women’s Speaker Series welcomes Kelly O’Connor McNees, author of Undiscovered Country, on September 24, and Katheryn Corbin offers a primitive raku workshop on September 30. The Lynden Sculpture Garden offers a unique experience of art in nature through its collection of more than 50 monumental sculptures sited across 40 acres of park, lake and woodland. The sculpture garden is open to art and nature lovers of all ages from 10 am to 5 pm every day except Thursdays (closed). In the summer the sculpture garden remains open until 7:30 pm on Wednesdays. Memberships are available. More information: http://lyndensculpturegarden.org or 414.446.8794.
Who: Reggie Wilson/Fist and Heel Performance Group and a large, intergenerational cast of local dancers and community members including the Roselette Dancers from the Clinton Rose Senior Center and the children participating in our collaborative camp with Walker’s Point Center for the Arts. What: CITIZEN: a dance about belonging, and not belonging. Tickets: $25/$20 Lynden members/$15 students. Buy tickets online at https://www.lyndensculpturegarden.org/Citizen or by phone at 414-446-8794. We are capping attendance, so we urge you to buy your tickets in advance. Audience members are welcome to come early to picnic and to see Ibile’s Voices, the work of artist-in-residence Arianne King Comer and the many community members who have joined her around the dye pot this month. This performance of CITIZEN is the culmination of a three-week residency at Lynden. Using the same methodology he piloted at Lynden in 2015 to adapt Moses(es), Reggie Wilson has been remaking CITIZEN for a large, intergenerational cast of local dancers and community members—many of whom actively address citizenship in their daily lives. CITIZEN began, three years ago, as an exploration of the meaning of citizenship for iconic African Americans who chose (choose) to remain at home in the face of pervasive racism. Wilson’s investigations were shaped by two questions: What does it mean to belong?and What does it mean to NOT want to belong? As he examined the questions raised by the human desire to belong, others arose: Do the injustices in today’s America engender a feeling of belonging? What supports belonging? And, finally: Is a sense of belonging, or not belonging, a private or a public matter? Like many of Wilson’s dances, CITIZEN privileges the kinesthetic over the cerebral, and makes a strong case for using dance to raise questions, express difficult ideas, offer alternatives, and provoke dialogues. This is a Call & Response event. Milwaukee native Reggie Wilson (Executive and Artistic Director, Choreographer, Performer) founded his company, Reggie Wilson/Fist & Heel Performance Group, in 1989. 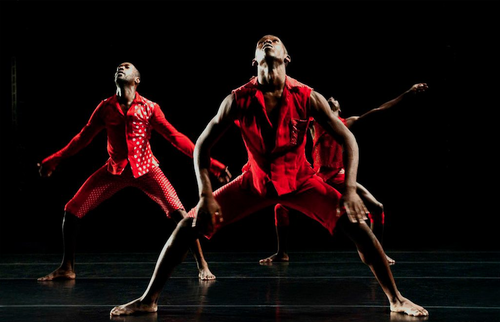 Wilson draws from the cultures of Africans in the Americas and combines them with post-modern elements and his own personal movement style to create what he often calls “post-African/Neo-HooDoo Modern dances.” His work has been presented nationally and internationally at venues such as Brooklyn Academy of Music, New York Live Arts, and Summerstage (NYC), Jacob’s Pillow Dance Festival (Lee, MA), Yerba Buena Center for the Arts (San Francisco), UCLA Live, and Redcat (Los Angeles), Linkfest and Festival e’Nkundleni (Zimbabwe), Dance Factory (South Africa), Danças na Cidade (Portugal), Festival Kaay Fecc (Senegal), The Politics of Ecstasy, and Tanzkongress 2013 (Germany). Wilson is a graduate of New York University, Tisch School of the Arts and has lectured, taught and conducted workshops and community projects throughout the US, Africa, Europe and the Caribbean. He has traveled extensively: to the Mississippi Delta to research secular and religious aspects of life there; to Trinidad and Tobago to research the Spiritual Baptists and the Shangoists; and also to Southern, Central, West and East Africa to work with dance/performance groups as well as diverse religious communities. He has served as visiting faculty at several universities including Yale, Princeton and Wesleyan. Mr. Wilson is the recipient of the Minnesota Dance Alliance’s McKnight National Fellowship (2000-2001). Wilson is also a 2002 BESSIE-New York Dance and Performance Award recipient for his work The Tie-tongued Goat and the Lightning Bug Who Tried to Put Her Foot Down and a 2002 John Simon Guggenheim Fellow. In recognition of his creative contributions to the field, Mr. Wilson was named a 2009 United States Artists Prudential Fellow and is a 2009 recipient of the Herb Alpert Award in Dance. In 2012, New York Live Arts presented a concert of selected Wilson works, theRevisitation, to critical acclaim and the same year he was named a Wesleyan University’s Creative Campus Fellow, received the 2012 Joyce Foundation Award for his new work Moses(es), and was named a Doris Duke Performing Artist. In 2013 Moses(es) had its NY premiere on BAM’s Next Wave Festival and continues to tour. Most recently, Wilson was curator of Danspace Project’s Dancing Platform Praying Grounds: Blackness, Churches, and Downtown Dance (Platform 2018) and created the commissioned work “…they stood shaking while others began to shout” specifically for the space at St. Mark’s Church-in-the-Bowery. The Lynden Sculpture Garden offers a unique experience of art in nature through its collection of more than 50 monumental sculptures sited across 40 acres of park, lake and woodland. The sculpture garden is open to art and nature lovers of all ages daily, 10 am-5 pm and Wednesdays 10 am-7:30 pm; closed Thursdays. Admission to the sculpture garden is $9 for adults and $7 for students and seniors; children under 6 and members are free. Annual memberships are also available.